Froberger enthusiasts have been very fortunate these last two years in that last year marked the four hundredth anniversary of the composer’s birth and this year marks the 350th anniversary of his death. This has meant that several scholars have taken the opportunity to discover more about this illusive figure who straddles the age of Schütz and the early baroque. Four books of Froberger’s works appeared between 1648 and 1658 and, for years after his death, were popular. There are one or two curiosities as regards this disc. First the cover shows a family attempting to go on holiday; a sepia brown photo seemingly of the 1930s or 1940s with two men under the car only visible by their protruding boots. 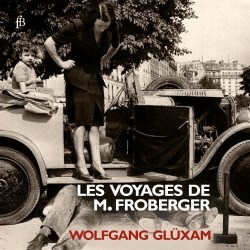 I suspect that the photo is a witty play on the CDs subtitle ‘Les Voyages de Froberger’. Secondly there is hardly an essay just a brief note, entitled ‘The Froberger Code’ by Wolfgang Glüxam himself. This gives details about the background to the recording and a reminder that the composer, born in Stuttgart, worked in Vienna, studied in Rome under Frescobaldi and was a visitor to Britain. On his way to British shores he was robbed and he had, it seems, a perilous Rhine crossing – hence the CD's subtitle. Lastly, at less than an hour it also feels a little ungenerous. A disc of Froberger appeared on Naxos, a double CD in 2003 (8.557472-73) played exclusively on the harpsichord by Sergio Vartolo. Sharing the music with an organ, as here, makes sense as Froberger was proficient on both keyboards. In fact he was recognised as a virtuoso and was especially significant in the developed of keyboard suites which he called ‘Partitas’. Glüxam has recorded the Partita VI which is in eight movements and Partita II in four movements as well as a Suite of five dances. The Allemande is favoured as are the Courante, the Sarabande and the Gigue all indicating a broad European outlook. Vartolo also recorded the Partita VI subtitled ‘auf Die Mayerin’ and also the Partita subtitled Lamento sopra la dolorosa perdita della Real Maesta Ferdinando IV. Ferdinando was head of the house of Hapsburg, who died in 1657, and who clearly Froberger knew well. With the Toccatas, Glüxam’s approach is first to play a freewheeling improvisation which segues into the opening ‘Grave’ in a rhythmically very free style. A faster section, probably in 4/4 is more strictly adhered to and an ensuing section in compound time is also fairly strict in tempo. The pulse in the final few bars acts as an ‘ad libitum’ coda. The A minor Toccata is played on the harpsichord, the D minor on an organ. The effect is rather like a fantasy but there are two other works on the disc with that title. The curiously named Partita VI auff die Mayerin, played here with such spirit and vigour, is an eight-movement dance suite. The booklet has the eighth movement as ‘Partita Grammatica’ whereas it should be ‘Crommatica’ or 'Cromatica'. Anyway the Mayerin theme on which these pieces are based is a secular lied known from its 1651 publication. The organ is very aptly chosen being that in the gloriously baroque Franciscan Church in Vienna, (consecrated in 1611) and constructed in 1642 by Johann Wöckherl. It’s a particularly pleasing and mellow instrument especially in the wonderful Fantasia sopra ut, re, me, fa, so, la made at exactly the time Froberger was the court organist in Vienna. Its specification is given in the booklet. The harpsichord is a two manual Flemish instrument of 1981 and, beware, is tuned to even tone. If you can get hold of this disc and want a representative selection of Froberger’s works on your shelf then despite its eccentricities, this is a good place to start. It's not too demanding and contains a wide variety of forms which Froberger promulgated. The recording is well focused and even in tone quality.